Savings for now. Help a child build a savings account and learn about banking. No monthly maintenance fee if the child is under the age of 18. Other fees may apply. Our financial specialists are ready to help. Visit a financial center to learn more and open an account. Savings for later. 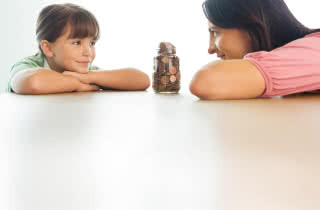 Deposit funds into a savings account as a gift for when a child reaches maturity. You may be charged a $1.00 fee for each additional transfer and withdrawal you make before your statement cycle ends. You will be charged no more than $XXXX of these fees each statement cycle. If you maintain a minimum daily balance of $300 or more in this account, you won't be charged this fee. You may be charged a $XXXX fee for each additional transfer and withdrawal you make before your statement cycle ends. If you maintain a minimum daily balance of $XXXX or more in this account, you won't be charged this fee. Need additional options? Other types of custodial accounts are available. Meet with a specialist at your local financial center to learn more. Our online website and mobile app ensure you get convenient savings account access whenever and almost wherever you are.